The Taking Action Project was a Professional Learning experience for teachers of Humanities, English and Technologies that combined aspects of human rights and social justice, outlined in topics sourced from Years 5 - 10 Australian Curriculum Geography and Civics and Citizenship. Students had the opportunity to produce a digital resource to argue their evidence-based perspective on a global issue and in doing so, demonstrate their Critical thinking, Ethical Understanding and Intercultural Understanding. This teaching and learning resource is suitable for teachers of all levels of experience from a range of subject areas such as History, Geography, English, Technologies and Civics and Citizenship. It provides a series of case studies showcasing a Project Based Learning (PBL) inquiry approach by students from Years 6 to Year 9. This publication, Taking Action: Students as Global Citizens, provides a valuable workshop tool as an illustration of quality teaching that demonstrates how several aspects of the Australian Curriculum can be implemented by creating an authentic, student-driven task. Click here to access the free Taking Action Resource. Copyright: Copyright in this publication, Taking Action: Students as Global Citizens, belongs to Association of Independent Schools of Western Australia (AISWA). Apart from the use as explicitly granted below, all other rights are reserved. All other persons may not reproduce, copy, broadcast, exhibit and/or distribute photographs and audio and/or video recordings from this publication. 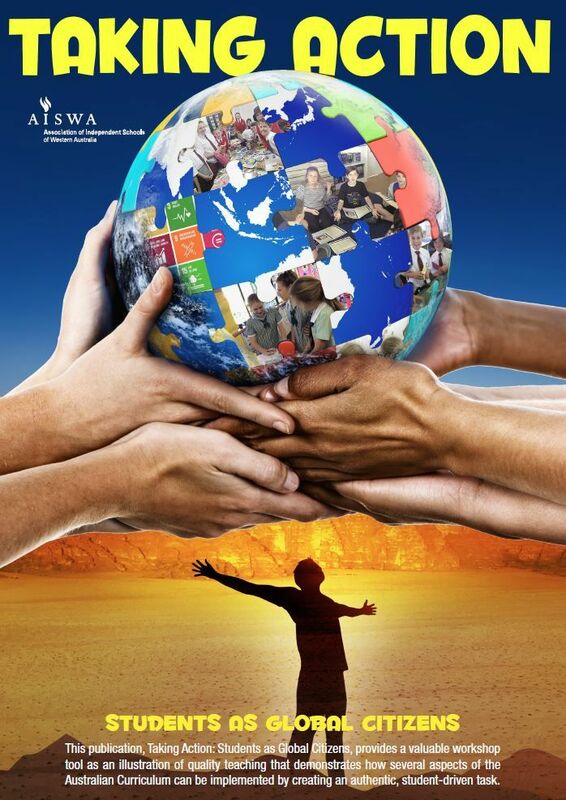 Schools that are members of AISWA are welcome to use, reproduce, copy, broadcast, exhibit and/or distribute photographs and audio and/or video recordings within this publication. Acknowledgement of AISWA would be appreciated. © AISWA Educational Publication teacher resource 2016 - not for resale. Disclaimer: The information contained in this publication is to the best of our knowledge and belief correct at time of publication. However, no warranty or guarantee is or can be provided by AISWA or any member of its staff, and no liability is or can be accepted for any loss or damage resulting from any person relying on or using the information contained in this publication. AISWA values education and equality of all students within Western Australia. However, the views expressed in this publication by the individual schools who participated in the project that resulted in the publication are their own and do not necessarily represent the views of AISWA.